Ten-year-old Brian was profoundly autistic. As I sat with him, he repetitively twirled a piece of tissue between his fingers, tilted his head to the right, and looked up to the left. It seemed as though he was looking at the tissue that he was twirling with his peripheral vision. No matter what I did, this beautiful little boy did not ever give me even the slightest glance. If I was quiet, he looked past or through me. If I was more vocal and animated, he turned his back and continued twirling. Afterwards, I explored my thoughts and feelings. I was frustrated with Brian’s lack of response. I believed that it meant something about me. I realized that I needed this little boy to respond so that I could feel good about my time with him and about myself. And I realized that this little boy had enough to deal with, without having the added responsibility of my feelings. That day I made a shift within myself. I decided that I could invite Brian to respond, without needing a response or pushing for one. In my next session with Brian, I told him that he did not have to look at me – that there was no pressure for him to do so. My words were genuine and heartfelt. Although Brian was non-verbal and it was assumed that he did not understand language, he stopped his twirling and looked at me. That look lasted several seconds. It was, for me, a powerful and transforming experience. Since that day, almost thirty years ago, I have had this kind of experience repeatedly, and have helped others to become more effective in parenting and teaching children with autism spectrum disorders by learning to shape their own thoughts and feelings. 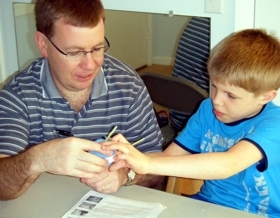 Our attitude, thoughts and feelings are extremely important when we teach or parent a child with autism, often, having a greater impact on our effectiveness than techniques or strategies. I have had the opportunity to work with children who break glass, smear feces, bite, kick, spit (one boy was so skilled he could hit people consistently in the eye from 2 meters away! ), pull their eyes forward out of the socket, etc. Why do children do these things? These behaviors are not caused by autism. Many children with autism do not behave this way, and other children who are not autistic do engage in such extreme behaviors. The behaviorists teach us that these behaviors are shaped by environment and by reaction, that they are learned behaviors. But if that is true (and I am sure that it is) who is teaching these children to act aggressively or in a self-injurious way? Certainly no parent has ever wanted to teach their child to bite, smear feces or tantrum. The behavioral model tells us that learning takes place through reinforcers. A reinforcer is like a twenty-dollar bill. It is a kind of payment. Many people do not realize that the reactions that they have to some of their children’s behavior are equivalent to giving their child a twenty dollar bill every time he or she does something particularly outlandish. A reinforcer is a response to a behavior that strengthens or maintains the behavior. In working with children with autism, we can observe three main types of reinforcer. The first is a kind of positive reinforcement, in which the child is getting something he or she want from the challenging behavior. The following story illustrates this how kind of reinforcer works. I met Kevin and his father, Joe, when Kevin was twelve. 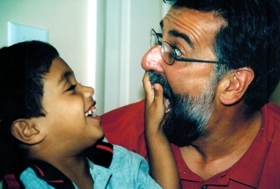 Joe’s primary difficulty with Kevin’s autism was his son’s increasing aggression. In our first session, I observed quietly while Kevin and his father interacted. Joe attempted to lead Kevin into the room, but Kevin refused to go. Joe repeatedly asked Kevin to join him in the room so they could have fun together, with no apparent response from Kevin. Suddenly and without warning, Kevin kicked his father as hard as he could. Joe became angry. His whole body stiffened and his jaw thrust forward. He grabbed Kevin by the arm, and Kevin kicked him again. Joe yelled at Kevin to stop and tried to restrain him. Kevin often hit people, kicked, scratched, bit etc. The best way his father knew to get him to stop was to physically restrain him, or, if all else failed, to hit him. But Kevin’s aggressive behavior was escalating. His father was at his wit’s end. Over the next few sessions, I focused primarily on Joe’s reactions to Kevin’s violence. 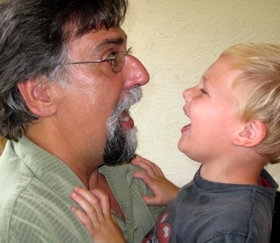 Underneath his anger, Joe believed that Kevin’s behavior was a reflection of his own poor parenting. Joe judged himself as an unfit father, and felt ashamed. In expressing and discussing his feelings, he began to change his outlook. Joe came to see that Kevin’s behavior was not a reflection of bad parenting – it was an indication that ‘normal’ parenting was being offered where extraordinary parenting was necessary. Joe came to realize that Kevin was socially motivated, and that he was extremely desirous of personal contact that fit a pattern. Joe began to feel proud that his son wanted contact with him, even if the form of the contact was bizarre. Instead of using these occurrences as times for anger and self-recrimination, Joe now wanted to use Kevin’s violent episodes as opportunities to find the extraordinary within himself. Instead of focusing on how to stop Kevin, Joe wanted to help Kevin learn to interact gently. Excited about his this shift in perspective, Joe was ready to try again. For Kevin, the violent interaction had become a ritual. It was consistent and predictable. It gave order to his otherwise chaotic and disorganized interactions and provided him with attention from another person. Often, people with autism would like some kind of attention, but they have no clear idea how to get it, how to control it, or what to do with it once they have it. Joe had unintentionally played a part in positively reinforcing Kevin’s behavior, by giving Kevin the reaction that Kevin wanted when Kevin kicked him. After years of escalating violence, Kevin began a period of intense swings from generally compliant and engaged, to occasionally very violent. Joe saw the violent incidents as tests and succeeded at not becoming reactive. Within several weeks, Kevin’s behavior became consistently gentle. Because Joe was genuine and consistent, it was easier for Kevin to see that the change was real, that the old way no longer worked, and that he could find new, gentler patterns of interaction. A second type of reinforcer is negative reinforcement. The payment involves taking away something that the person does not want. It’s like saying, “I will pay you by pulling that splinter out of your finger”. Todd was nine when I first saw him. He was playing serenely by himself in the playroom. He had just opened his favorite dinosaur book, when his mother, Fran, entered the room to interact with him. Fran was enthusiastic, vocal, excited about the book, and dramatic in showing Todd that she was getting her own book to read. He exploded in a tantrum. He threw his head back and screamed. He fell on the floor and began to thrash around. It was painful for Fran to feel that she had caused her own child so much distress. Her voice became very quiet. She softly apologized. She became slow and soft in her movements. She made herself unobtrusive and easy to ignore. Todd went back to his reading. To me, this looked like a form of communication. “Don’t bug me, I’m reading.” And it worked perfectly to Todd’s advantage. If anyone intruded on his reverie in any way, he had learned to tantrum and appear extremely distressed. When the “intruder” became uncomfortable and withdrew, Todd was being reinforced for his tantruming behavior. In subsequent sessions, Fran looked at the belief that she was causing her son great distress. She realized that the tantruming was a way for him to tell her that he preferred to be left alone. She had become accustomed to leaving him alone almost all the time, due to fear of his tantrums. In a sense, she was making it easier for him to remain encapsulated. Fran came to see that, even if Todd was distressed by interaction, it did not benefit him if she diminished her presence in his life. In order to help her son, it was necessary for her to assist him in going through his difficulties and getting over them. It helped Fran to observe. At one point, I was playing with Todd in a very animated way. He threw his head back and screamed. I threw my head back and laughed. (It is important to note that I was not laughing at Todd, and that if there had been anything mocking or insensitive about my attitude, my laughing would have been totally counterproductive.) Todd immediately stopped screaming and looked at me. I paused for a moment, beamed my appreciation of his attentiveness, and then threw my head back and laughed again. This time, Todd laughed too. Many people with autism are more socially aware than we suspect. When they notice that their action is not producing the desired effect on a new person, after a little testing, they often stop performing that action with the new person. After my first session with him, Todd laughed every time he saw me. In the weeks that followed, Fran felt freer to encourage Todd to interact. When Todd appeared distressed, his behavior no longer had the same effect on her, because she no longer held the same beliefs about it. She became a mother whose love took the form of helping her child develop strength where there was once weakness. Todd’s level of interaction and self-confidence increased. The two forms of reinforcer described so far are social. A third type of reinforcer is more internal. It has to do with the person’s attempt to balance or soothe themselves, using their own sensations and biochemistry. This process takes place within the person. For example, we have all learned that the body can produce a natural equivalent of morphine (endorphins) in a variety of situations. That is an example of the third class of reinforcer. Any one or all three types of reinforcers in combination could be contributing to the learning and continuation of a certain challenging or extreme behavior. For thirty years, I have used attitudinal training to help parents, teachers and caregivers become more comfortable with the challenging behaviors of their children and students with autism. When caregivers learn to change their thoughts and feelings about challenging behaviors, both the frequency and the intensity of the incidents are almost immediately diminished. This attitudinal approach is not magic; it makes perfect sense in behavioral terms. Why? When we are uncomfortable, we behave differently. Changes occur in our voices, coloring, movements and breathing. Our words and choices of actions are different. When we are uncomfortable, we are more likely to react in ways that reinforce the very behavior we want to change in the child. If someone is doing something that we might interpret as hurtful or frightening, as in Kevin’s case, we are more likely to restrain, yell, hit, or behave in a way that could be a reinforcer for that behavior. If we think we are distressing someone and we are uncomfortable about it, as in Todd’s case, we are more likely to become like wallpaper, or behave in other ways that would tend to strongly reinforce that behavior. In fact, these reactions become a predictable language and ritual of discomfort. When parents become more comfortable with the very behaviors that they found so disturbing, they tend to act in ways that are less reinforcing of the challenging behavior. Parents and teachers sometimes have thoughts and feelings that are indirectly expressed in their interactions with their children and which result in difficulties. If a father needs his daughter to perform so that he can feel good about his teaching ability, he may create feelings of pressure, which the child will sense and resist. If a mother pities her son, she will be more likely to cushion and protect him rather than challenge him and help him get past his difficulties. If a teacher doesn’t believe deeply in a child’s capacity to grow and change, she will not teach effectively. If the teacher is bored, passionless, and going through the motions, the child will be disengaged. If a parent is busy thinking “Why me?” and “What did I do wrong?” the parent will be self-absorbed and not fully engaged with their child. The answer to this dilemma is attitudinal training. Attitudinal training has two aspects. The first aspect is to help the parent or teacher, by observation and self-exploration, identify the thoughts and feelings that can get in the way. The second aspect is to help the adult find a way to change those thoughts and feelings. Attitudinal training enables parents and teachers to function with greater comfort. If they are unperturbed by various behaviors, the children learn that there are no social / magical outcomes that come from self-injury, violence, etc. Learned behaviors that can be the source of so many difficulties will not be inadvertently taught. While behaviorists employ a number of excellent strategies to deal with these challenging behaviors once they have been learned, these strategies would be less necessary if the challenging behaviors are not reinforced with intense reactions in the first place. 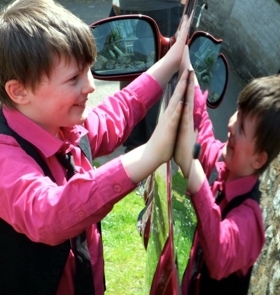 If we learn how to use the influence of our attitudes effectively, we can also become much more capable of motivating and inspiring children with autism to develop self-confidence, communication and social skills. Using this approach, the primary job is not to teach a particular subject or skill but to teach a love of that subject or skill. For example, if I am working with a non-verbal child, I want to teach a love for making sounds and an utter delight in what happens when sounds are made. How do you teach a love for and delight in something? Love and delight for something is the same as motivation and drive. Motivation is an attitudinal phenomenon. To teach attitude, we must learn the language of attitude. When we are not perturbed by violence, distress, or lack of interaction, we can be delighted by gentle touch, affection, eye contact, vocalizations, and every form of interaction, no matter how apparently small or insignificant. When we genuinely delight in these things, we tend to act, to vocalize, to move and to respond in ways that are incredibly reinforcing. Not only are our actions reinforcing, but we also become more charismatic to the child. This is important with children with autism. They are identified as having autism because of their difficulties in socializing and communicating with people. When we become more compelling and engaging, the child focuses on us more. As a result, they exercise and strengthen the “muscles” of relationship. Their social skills improve. Usually, if Sarah was given O’s, they went right to her mouth. But this time, she looked at them, and then looked up and off to the right. Very quietly, almost inaudibly, Sarah said “O’s”. With a laugh, the teacher repeated “O’s” and ran again to the shelf, grabbed more O’s, ran back and put them into Sarah’s hand. Sarah smiled and loudly said “O’s!” and the teacher ran for more. This time, before he could get back to Sarah, she yelled “O’s” again and he turned so fast toward the cereal that he fell. Sarah laughed. The teacher got up quickly, grabbed the O’s, ran back to her and again Sarah yelled before he got to her. This was the start of an incredible game in which Sarah periodically called out “O’s” and, no matter what was happening, the teacher ran to the bowl and brought back the cereal. One of the most striking and beautiful aspects of this activity was the look on Sarah’s face. Usually, her expression was neutral. While she was playing this game, her smile beamed from ear to ear. Sarah was not just making a sound for a particular event. She was delighting in the power of her sound. Notice the attitude of Sarah’s teacher. When he began the session and Sarah was very disengaged, the he was not thinking, “This is going to be tough. She’s not responding to me. I am not doing so well.” Instead, he was thinking, “This is perfect. This is the way that we begin. Even if she is unaware of me, I am aware of and enjoying her. Everything that she says and does, speaks to me whether she intends it or not.” Whether it was a sound or the slightest movement the teacher was ready to respond with delight as though it was a direct communication from Sarah to him. Some people reading this will be struck by the similarity with behavioral principles. (Later we told Sarah to “say ‘O’” and when she complied, we again reacted.) With some approaches to behaviorism, the focus is on behavior and there is not such a high degree of awareness of the feelings and thoughts of the teacher and the teacher’s level of enthusiasm and delight. If there were more focus on the behavioral dynamics and less focus on the attitudinal dynamics, the reinforcer would have been the Cheerios. But it wasn’t. Often, Sarah did not even eat the Cheerios that she obtained in this way. The main event and, in behavioral terms, the reinforcer for Sarah, was the pleasure she derived from using a sound to move a person. The key words here are pleasure and person. When I train parents and teachers, we don’t wait for the person with autism to enjoy the interpersonal activity. Our intention is to create within us a heightened enjoyment of the activity or interaction, and then to look for a way to draw the child into that enjoyment. I have focused here on the attitudinal aspect of work with people with autism. But I am not suggesting that it is only “heart” that counts rather than educational techniques, nor am I suggesting that success is inevitable if our hearts are in the right place and we have mastered our thoughts and feelings. Technical skill and adherence to purely scientific assessment and teaching strategies, with little or no focus on underlying feelings and attitudes, may produce students who “go through the motions” but who are less emotionally alive. But a purely attitudinal approach which fails to incorporate educational skill, strategy and assessment tends to result in happier, more emotionally expressive, more interactive students who “plateau” in their learning at a point where appropriate use of more scientific assessment and educational methods could provide a most necessary benefit. The most powerful approach to working with children with autism is a marriage of skill and feeling, science and faith, technique and heart. As parents and educators, we can rise to the challenge of raising and teaching children with autism by strengthening both our own hearts and our own minds. We can strengthen our hearts by helping each other to be more aware of our underlying thoughts and feelings, supporting each other in changing the thoughts and feelings that are counter-productive, and engendering in ourselves the love and delight that awakens love and delight in our children. We can strengthen our minds by teaching ourselves the educational techniques and behavioral principles that science and research are substantiating. When we combine these things within ourselves, we become more than the sum of the parts. We become the parents and educators that are best suited to help our children become more complete, more powerful, and more able to achieve their own potential.